The 2017 Self-Direction Awards Ceremony recognized individuals’ exceptional contribution to advancing self-direction and supporting self-directing participants. All awards were given to individuals, not programs or providers. In each case, awards recognized contributions over a career of service or an exceptional contribution during the past year. Award recipients were nominated by the public and determined by members. 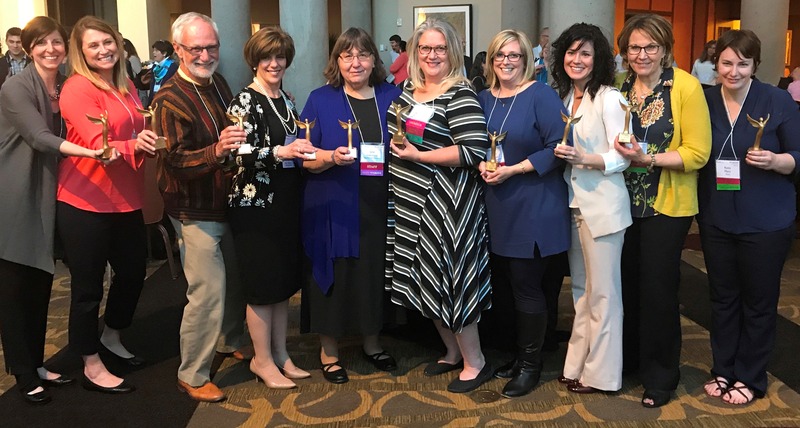 The award recipients were announced during our May 2017 Self-Direction Conference in Baltimore, Maryland. Outstanding Self-Direction Program Administrator: Cara Benson. This award goes to a self-direction program administrator, either at a state or other public entity, who has exhibited outstanding leadership in the administration of a self-direction program. This person has demonstrated an extraordinary commitment to service and quality that is recognized both by the person’s colleagues and the people she or he serves. This award is aimed at program administrators and not program staff who directly serve participants. View Cara's nomination here. Outstanding Leadership of Self-Direction Program Design: Kyla Mundwiller. This award also goes to a self-direction program administrator, either at the local, state or national level, who has exhibited outstanding leadership in the design of a self-direction program. To receive this award, the person must work in a program with an unusually creative and effective design and have had a major responsibility for that design. View Kyla's nomination here. Excellence in Financial Management Services (FMS): Shantel Jaszcak. This award goes to an employee of an FMS entity at either a Fiscal/Employer Agent or Agency with Choice who has shown exemplary leadership of the FMS portions of the self-direction program. This person has demonstrated an extraordinary commitment to service and quality that is recognized by both person's colleagues and the people he or she serves. This award is aimed at staff of an FMS provider. View Shantel's nomination here. Outstanding FMS Customer Service Representative: Raina Marti. This award goes to an employee of an FMS entity who has exhibited outstanding customer service in a self-direction program. To receive this award, the person needs to have consistently gone above and beyond what is required to assure participants, workers, families, and others receive excellent service. This person should have been recognized both by colleagues and participants as providing exceptional service. View Raini's nomination here. Excellence in Payments or Taxes: Diane Alberigi. This award goes to an employee of an FMS entity who has shown exceptional skill in managing payroll and/or tax functions in Fiscal/Employer Agent or Agency with Choice. This may be a front line staff member, a supervisor, or a manager who is recognized by his or her colleagues as the expert on tax and/or payroll issues. View Diane's nomination here. Excellence in Information & Assistance: John Mezydlo. This award goes to a person who provides Information & Assistance in self-direction, such as a Support Broker, Support Coordinator, Navigator, Counselor, Case Manager or similar role. This person may work for a governmental agency, a provider organization, or directly for participants. This person should be recognized both by colleagues and participants as someone who has demonstrated exceptional skill, compassion, and commitment in their service to self-direction program participants. View John's nomination here. Innovation in Self-Direction: Kevin J. Mahoney. This award goes to anyone who has done an exemplary job of advancing a meaningful and significant innovation in self-direction. This may range from technical innovations in FMS or service coordination to broad scope innovations in program design or even statutory authority. This award recognizes either a career of innovation or a specific innovation in which this person played a leadership role. Recognizing that that innovations sometimes take time to totally roll out, however, specific innovations are not limited to the last year, but should have occurred within the past 5 years. View Kevin's nomination here. Outstanding Advocate for Self-Direction: Steve Larson. This award goes to anyone who has consistently advocated for self-direction with persistence, passion, and eloquence. This may be a participant, direct care worker, state administrator, FMS employee, Information & Assistance provider, etc. : anyone who has stood up for self-direction. View Steve's nomination here. Outstanding Involvement in Self-Direction: Cindy Bentley. This award goes to a self-directing participant or family member who has gone beyond successful management of her or his care to helping others in self-direction programs or helping improve self-direction programs as a whole. This may include activity in peer support networks, program advisory groups, advocacy organizations, or any activity that has advanced self-direction on the individual, local, state, or national levels. View Cindy's nomination here. Outstanding Worker in Self-Direction: Brad Perry. This award goes to a direct care worker who has gone above and beyond to support the self-directing individual(s) she or he serves. This person may be nominated by the participant, their representative, family member, or self-direction program staff. View Brad's nomination here.